Boston, MA [June 6, 2017] – ath Power Consulting, a leading financial services research and strategy firm, today announced its release of The ath Power Small Business Digital Banking Study™, a detailed assessment of small business digital banking usage, offerings, delivery methods, and customer experiences at financial institutions (FIs) nationwide. Based on a survey of 441 small business owners (SBOs) conducted during Q1 2017, study findings revealed that digital channels have become ‘primary’ for small business banking customers with two-thirds identifying online banking (52%) or mobile banking (14%) as their preferred channel. However, branches still play an important role for many SBOs with 28% considering them their primary channel, almost double the rate of consumer preference for in-person banking (15%). Interestingly, the small business mobile adoption rate is significantly trailing that of consumer banking, with more than twice the amount of consumers preferring mobile over SBOs. Even though over eight-in-ten SBOs state that mobile banking is ‘very important’ or ‘important’ to their business needs, they continue to use online and branch banking at a higher frequency. Many SBOs feel that the small business mobile apps currently available to them are largely undeveloped, with one-third of those citing dissatisfaction saying that mobile functionality is too limited for business use. This finding indicates opportunities for FIs to improve and expand their small business mobile banking solutions. The study found that digital capabilities play a significant role in improving SBO efficiency. 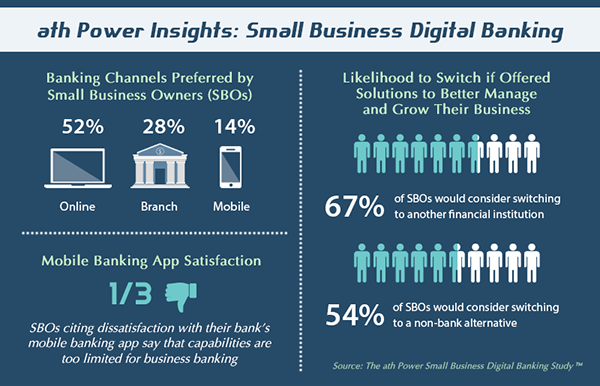 For example, over half (55%) of SBOs use mobile remote deposit capture (MRDC) for depositing checks for their business. Once they try MRDC, almost nine-in-ten say that this feature is ‘very important’ or ‘important’ to them. SBOs also express a desire for other capabilities that can accelerate cash receipts and boost cash flow, including online account opening, online business loan applications, digital payments, and business planning/management tools. Findings also revealed that one-third of SBOs are either ‘very likely’ or ‘likely’ to switch business accounts to another financial institution in the near future. Notably, two-thirds would consider switching to a competing FI if they offered products and services to help them better manage and grow their business, and over half (54%) would consider switching to a non-bank alternative in the same scenario. 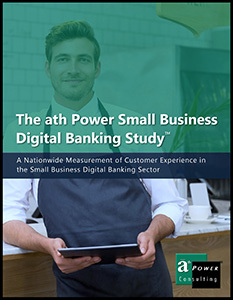 To learn more or order the report, visit https://www.athpower.com/the-ath-power-small-business-digital-banking-study/. ath Power is the premier provider of customer experience solutions for the financial services industry, offering competitive intelligence, survey and shop research, compliance auditing, market analyses, employee training, and strategic consulting. Since 1997, we have helped improve customer retention, build brand loyalty, ensure compliance, and increase profitability for financial institutions across North America. To learn more, visit https://www.athpower.com.